Maybe it was the relief of seeing something interesting, or the after effects of emergency dental surgery, but I really liked Dum Maaro Dum. It’s a standard cops and gangsters story, with bit of Pulp Fiction flavour (right down to a character called Vincent Vega). It’s a film to see for what happens and how, although there are few significant surprises and too many contrivances that deflate the second half. Ultimately the straight up thriller isn’t blended so well with the masala elements so it’s not as satisfying as it could have been, but it’s still good fun. Abhishek Bachchan is the reformed corrupt cop ACP Vishnu Kamath, sent to Goa to deal with the drug issue. I’m not always a fan of his, but I really liked this performance. His entrance was fabulous and exploded in a sparkly manga style. Kamath’s character is established by exposition so Abhishek has less to work with as it isn’t a development the viewer is involved in. But I could totally buy his conversion from corrupt cop to crusader. He was confronted with the consequences of being on the take and he made a decision. For the most he plays it straight as an officer with a past and on a mission. I’m not sure whether I like what seems to be a constant need to pay homage to his father, as I then see Abhishek as someone doing an impression of his dad rather than successfully portraying a character. It works here as he was great with the one-liners and it is quite 70s dishoom stuff–and the Kaike Paan scene was very amusing! Lorry (Prateik) is a drug mule, seduced by a woman in a sequinned bikini mere hours after the love of his life departed for the US. Yes. He is supposed to be 17 but even so, he was an idiot. He took the drug gig to get the money for college despite knowing better. And he is an athlete so we know they never make stupid decisions about drugs! Prateik certainly does well in being irritating. I was so annoyed at the way he lashed out at his girlfriend when she won a scholarship he wanted. There wasn’t much character development in Lorry. I got no sense that he would be much the wiser after the drama played out as his life seemed destined to pick up where it left off. Prateik hammed it up in some of his post-arrest scenes and I thought he was OK without being great; but that may just be because I dislike his character so in fact he may have given the performance of a lifetime. The camera certainly loves him. 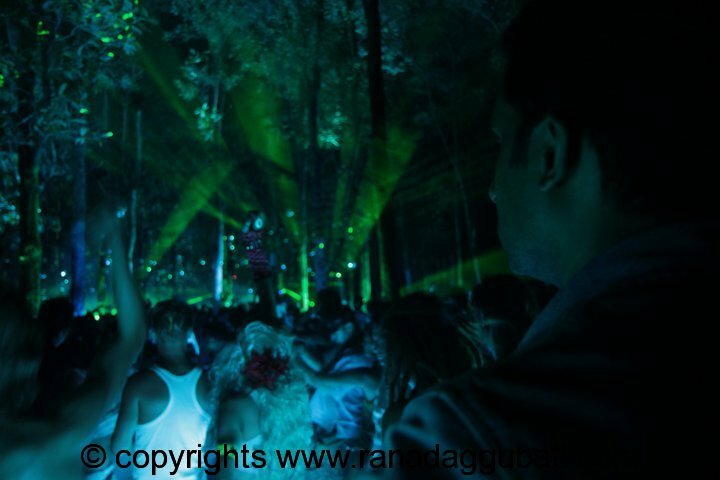 Joki (Rana Daggubati) is a musician, and for most of the film he is the moral compass of the story. I wonder why Rohan Sippy didn’t give Joki a back story to deal with the accent instead of dubbing. It’s not like he didn’t know who he was casting. Joki is in some respects the junior version of Kamath. He stood by and let the underworld taint the lives of people around him, and is forced to decide whether he will continue to turn a blind eye. His journey to the same tipping point as Kamath forms a lot of the story, although Joki is rarely centre stage. He has to connect with several of the characters as well as explain bits of plot, and I thought Rana was convincing and appropriately low key in most scenes. The dialogue sometimes sounded slightly flat, so I am judging more on expression and reactions and I thought he was good. The writing lets Joki down as his motivations aren’t always well articulated, and later things take a turn for the WTF. I like an abundance of pleasing visuals and Rana features heavily in those moments. He looked great and I have to say the wardrobe team aced Joki’s style, the slightly hippy muso look but not too try-hard. Bipasha Basu is Zoe, Joki’s old flame and currently in the possession of Biscuit (Aditya Pancholi in a creepy sleazy caricature). She is another of the characters having to deal with the consequences of bad decisions, and is more clear sighted than some about human behaviour. I did have an eyeroll moment when her character was introduced as half English. ‘Aha’ I thought, ‘That’s how they justify her sleeping with men she is not married to and all the drug taking etc. She’s a skanky half white girl.’ Bipasha impressed me with Zoe’s transition from light-hearted to darker emotions. I didn’t get any sizzling chemistry between her and Rana, they seemed a couple who had been together for a while and were completely comfortable with each other. There are a few things I found hard to swallow. The methods by which Kamath and Joki arrived at what they each knew were just too sketchily written and didn’t hold up. The villain Barbossa was a cipher not a character and failed to create real menace. All the characters were a bit underwritten so everything relied on being swept up in the story. When the other story elements dropped away in the hunt for Barbossa, the lack of tension undid the energy of the first half. Things I enjoyed perhaps more than I should have included Abhishek stirring up a drug cocktail as though he was mixing paint, Mercy for his name and his fab satin shirts (I suspect I know why he was Goa’s oldest virgin just based on the pink ruffly number) and the very useful electric crematorium. Identifying an unknown suspect’s nationality by the label in their sequinned underwear seemed slightly improbable. On that basis, today I am Italian and yesterday was Chinese/Australian. Identifying said suspect at the airport by her sparkly undies was hopefully intentionally funny! I didn’t hate Deepika’s item number. Given this is a film about the drug trade, it actually worked well as one of the few scenes that showed the drug culture that sustains the business. The song and the choreography were dire but I think it was successful in giving the rave and party context and Deepika did what she was asked to do – stand around and look good. The Abhishek Thayn Thayn ‘song’ was dire. He raps like my dad would if we let him. I really don’t know what they were thinking, and the timing of this interlude was all wrong. Bipasha’s last song was sad as it was almost a mirror image of her first song with Rana, but a reflection that became a horrible parody of her earlier happiness. The rest of the songs were unnecessary although I don’t dislike them at all. The background score was apt but it’s not memorable either. The cinematography is excellent and the film looks great. The camera often creates a disorientation and fractured sense of time that suits the story. The second half drags, the ending is too pat and the closing visuals are overly sentimental, but it’s also satisfactory as I like a good comeuppance. Perhaps I laughed more than I should have (I’ll blame the painkillers…oh wait…wasn’t there a message about drugs? ), but I was highly entertained. Heather Says: For me, Dum Maaro Dum tries to mix the Usual Suspects with Dirty Harry and fails to quite hit the mark on either front. But I think it’s an entertaining watch with good performances from the core cast. While the story is overall good, there are some gaping plot holes and the ever increasing body count ensures that the number of possible candidates for Barbossa grows ever smaller, not helping plot development. I found the dubbed voice for Rana to be particularly grating and doesn’t suit him at all, although this may purely be due to seeing his previous film Leader. Abhishek Bachchan is good in his role as the reformed cop but tends to ham it up a little too much in the scenes with his wife. He is convincing in his ruthlessness although some of the torture scenes were too over the top and ended up as amusing rather than gruesome. This may have been the intention though as they were really silly. Some of the best scenes and dialogue are with Kamath and his partners, Mercy and Rane. I loved Mercy’s collection of ‘date-night’ shirts which are the most lurid I have ever seen and perhaps explain why he is the oldest virgin inGoa. Bipasha Basu is excellent as Zoe and I thought her transformation from happy fiancée to drug-addicted mistress is well shown – although she does perhaps look a bit too healthy. She does manage to convey her mental deterioration and distress at her situation and there is some definite onscreen chemistry between her and Rana. The development of their relationship shown by the photographs on the fridge is a clever idea and one I really liked. Rana is less convincing as Joki, and his relationship with Lorry is too contrived. But his character is better in his own story loop and I liked him much more in the second half when he was on the trail of Barbossa. Overall though Joki is the leasat satisfying character in the story and I would have liked to see more of his background. He wasn’t quite the free-wheeling spirit he was supposed to be. This is the third film I’ve seen with Prateik, and he continues to be very impressive. His portrayal of Lorry is convincing and just naïve enough to be a believable character. The romance with his girlfriend was good, and he was excellent as the scared kid in jail trying to just survive. The second half of the film starts to drag as it becomes obvious where the story is going to end and there are just too many diversions as the writers try to be clever and insert far too many twists and ‘surprises’ into the plot. None of which are vey twisty or surprising. The soundtrack has been a topic of conversation online, but it wasn’t very memorable and overall the songs were badly pictured, apart from Te Amo with Bipasha and Rana which was pleasant but not spectacular. The item song with Deepika Padukone was absolutely terrible with no choreography to speak of, and looked much more like a cheap MTV video for a wannabe Christina Aguilera. I really didn’t like it at all – and neither did the audience who were laughing! There was a lot to like about this film. The comradeship between the three police officers works well and their raids are dramatic with some light-hearted moments to even up the blood-shed. 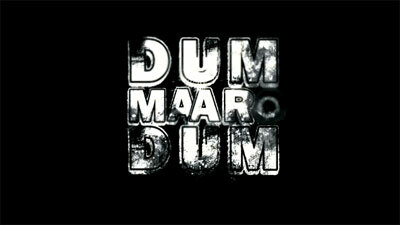 Dum Maaro Dum is a watchable film and strong performances almost make up for the weaknesses of the story. A better climax would have helped immensely but there is enough in the story to make it one of the better Hindi releases this year so far. This entry was posted in Bollywood and tagged Abhishek Bachchan, Aditya Pancholi, Bipasha Basu, Dum Maaro Dum, Dum Maro Dum, Prateik, Rana Daggubati, Rohan Sippy. Bookmark the permalink. I think you (and Temple) liked this a lot more than I did 🙂 I guessed about Barbossa near the start (too similar to the Usual Suspects etc) and the only surprise was the number of people they managed to kill before finally finding out the truth. But, ignoring the story, I thought the actors all gave good performances and it was entertaining enough. I did like Abhishek in this and it was good to see him in a role which seemed to fit him better. Really could have done without the Deepika number though! Another rather positive review… Iiiiii’m getting curious! Im going more with Heather than with Tee on this one.. there were too many moments where the logic was packed, wrapped, booted out of the window which got the better of me (added to the frustration of the worst possible seats urgg) I liked prateik more than Rana, thought rana-bips sizzled together, and felt the deepika track placement really annoying. though the ‘things hard to swallow’ is bang-on and they really shouldnt have killed abhishek… i was sooo rooting for a sequel – phir se maaro dum anyone?! Yes, I read your review and think we’re more on the same page about this film. 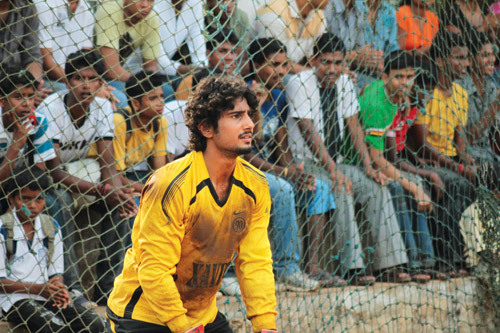 I agree that Prateik was excellent – and for a change I did like Abhishek and thought he was much less wooden than usual. I’m not usually a fan!